Having run both Spring and Autumn marathons I’m not sure which is the better option. Spring ones means training through the worst of the Winter and this has been a particularly tough one with one of our long runs being so cold that it took your breathe away, we’ve also had snow and ice to contend with and it hasn’t been fun. 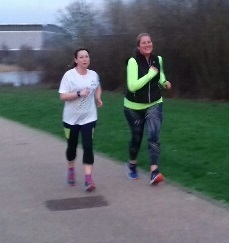 Last year, a few of us did an Autumn one which meant training through the hottest part of the Summer with our longest runs in August, we had to get up and out very early to miss the worst of the heat but it was still exhausting. 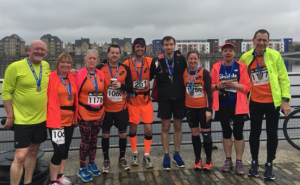 The problem is that race day weather is so unpredictable as we saw this weekend at the London Marathon when temperatures hit a record breaking 24 degrees and at Loch Ness Marathon last September when it dropped like a stone and left us freezing on top of a Scottish mountain. Unfortunately the weather this weekend meant over a hundred people were taken to hospital in a serious condition and one sadly died. Matt Campbell was an experienced and very good runner as were many of the other people who were seriously affected by the heat. I was on the elite water station at three and a half miles and people were struggling even then because it was already scorching by 10.30 am, a couple of hours later I was on the Embankment waiting for our runners to come through 25 miles and there were lots of runners in serious trouble; the legs had gone and they were staggering all over the place. We saw runners that we knew like Terry Merry and Jonathan Algar who were so focused on putting one foot in front of the other and getting through that they couldn’t hear a dozen of us yelling their names and almost missed us. There were a lot of broken people out there and anyone who went the distance should be immensely proud of themselves just for finishing. It’s unforgivable that the water stations at 8, 9 and 10 miles ran out of water. My nephew was on water station duty at 9 miles with the sea cadets and didn’t think that they had anywhere near as much water as in previous years and ran out after only about a third of the runners had been through, it took an hour to replenish stocks and with no water at the next one either, many runners would have gone from mile 7 to 11 with no water. Having said that, many runners were taking two or three bottles at each stop without considering anyone else and I’m sure at least some of that ended up being chucked aside so I guess we have to take some responsibility for that as runners. We didn’t have many SLGR out there but the ones that were did us proud. 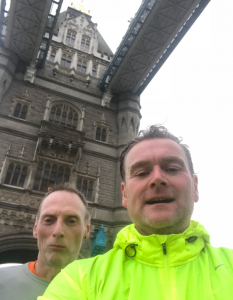 Jonathan was the first SLoGgeR home in 4.32 having lost his running buddy Mark Browne on Tower Bridge. Mark came in at 5.15 after struggling with his achilles, then Susan Neal in 6.20, Alex Slater in 6.38 and Kate Shutt in 7.02. You should all be very pleased with your times in that heat, especially as most of you had never done a marathon before. Please send us some of your pics and we’ll post them on the blog. Entry opens on Monday for next year’s London Marathon and I am sure many of you will be applying yet again, let’s hope we have a few more successful applicants next year than we did this year but for those of you who get rejected, please keep a copy of either your entry or rejection emails if you want to be entered in to the team ballot and make sure your subscription is paid up or you won’t be eligible. Thank you to everyone who has already renewed their membership and to those who haven’t yet, what are you waiting for ? We have had a great year and have lots of exciting new stuff going on for the coming year. We have updated the Welcome Pack as attached above and look forward to having you all with us for another year. Many thanks for being part of the team. SLGR are a very sociable bunch who like nothing better than a post-race chow down like we had after Dartford Half in March when a load of us headed to the pub for lunch, but like a bunch of teenagers everyone was soon huddled over their phones. They weren’t being anti-social and checking out Facebook or Twitter, they were checking Strava stats. Pace, elevation, calories, times etc. Now while this may be the kind of thing you would expect to see from elite athletes figuring out where it went right or wrong, where they could hone their technique, that wasn’t quite what the team were doing. One of the first things that we all look at is how many calories we have burned, so we know we’ve earned the lunch we are about to consume. After Paddock Wood half we were all stood at the finish, welcoming one another in and then the phones came out and the stats were once again discussed in detail and compared to our fellow runners in a game of what Gavin Mundy called Runner’s Top Trumps, pick a stat and compare it, who got the best pace, who got the highest elevation, what distance you got and most importantly, who burned the most calories. It entertained us for ages. For what we are about to consume, may Strava make us truly deserving. We kicked off with Tropicana Nights on Friday with some amazing 80’s costumes and some very suspect wigs. Thanks Mel Preston for organising. Saturday morning saw the second KLAN mob match which unfortunately clashed with two other big running events this weekend so we only had a handful of brave souls taking on the other 6 clubs at Hoblingwell Parkrun including three runners who also ran on Sunday and all busted out PB’s which is very impressive. I don’t know what the score was but I’m sure we fought a brave fight against some much bigger opponents and as usual with SLGR it’s more about the taking part and the post run breakfast. 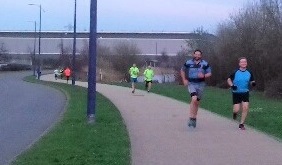 Well done to all those who took part, hopefully next time we’ll have a more suitable date and lots more runners. 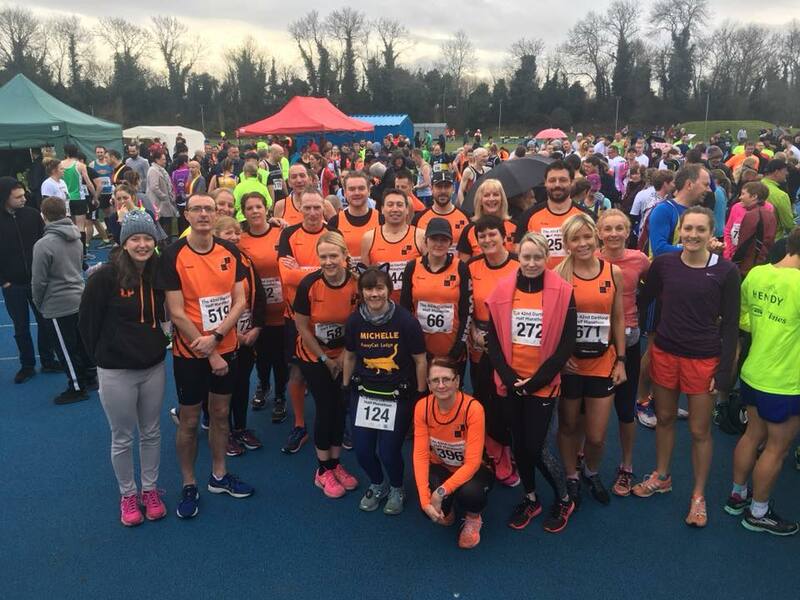 Sunday was a double header with the Chatham Maritime 10k April GP event and the Paddock Wood half marathon which fitted in nicely for those training for London and Edinburgh marathons. The rain didn’t stop for either event but there were some very impressive times. At the Chatham GP event Phil Batchelor and Michelle Loader both managed PB’s. Obviously the mob match was the perfect warm up for Phil. It looks like a nice course and relatively flat. 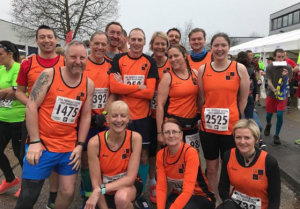 I was at the Paddock Wood half marathon along with quite a few others, I think we got most of them in the photos either before or after but there is always someone in the queue for the loo who misses out. The toilet queues were pretty horrendous with two in a nearby hall that didn’t flush at all and had to be filled with buckets and the ever fragrant portaloos outside with a huge wait. The baggage tent was obviously leaking as our dry warm clothes for after the race were all a bit damp and cold. 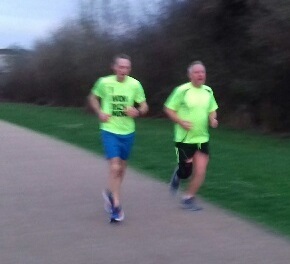 Apart from those two niggles it was a well organised and well marshalled event. The roads were mostly traffic free despite only the first two miles being closed and those cars we did see were patient and encouraging which makes a nice change. The route is described as being relatively flat apart from a couple of hump bridges over the railway lines, I think there were actually five or six and they were fairly substantial humps but the rest was pretty flat, apart from the pot holes, there were a lot of puddles to dodge and the view mostly consisted of hedges, occasional houses and a peak at some fields but not a whole lot else. Having said that, it does have PB potential and was a pleasant run with lots of support, orange segments and jelly babies. 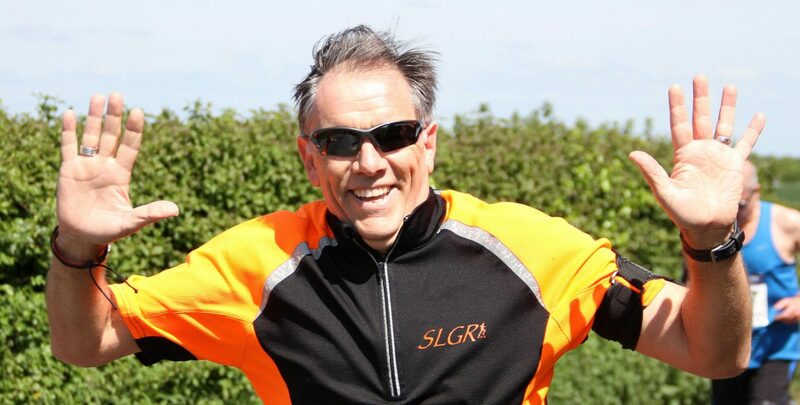 Both Gavin Mundy and Lesley Pilson broke the two hour barrier for the first time to claim very impressive PB’s particularly as they were also both at the mob match and Lesley was the only team member to attend three of the four SLGR events this weekend. I also managed a PB by three minutes along with my running buddy Natasha Godfrey who smashed her Dartford half time by six minutes. It was a good last run before London for Jonathan Algar, Mark Browne, Alex Slatter and Kate Shutt, it’s all about the taper now, take it easy guys and enjoy race day. So here’s what happens on a regular Thursday night out with the SLGR gang. 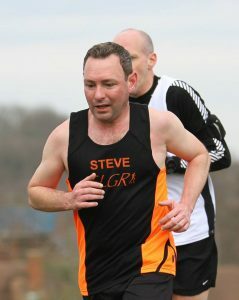 With the April GP event, the Chatham 10k and also the Paddock Wood half on Sunday, it’s going to be a busy weekend for SLGR. So it was the perfect time to work on race pacing for these events. 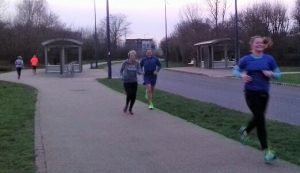 We met at the Premier Inn by the Bridge in Dartford and headed around the corner for our session. 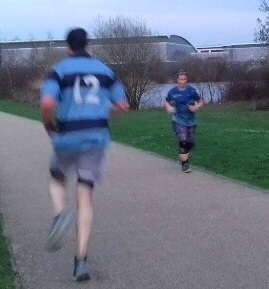 With everyone having worked out what pace they should be running at for their chosen event distance we started with 12 minutes at that pace with a 90 second recovery before 4 lots of 3 minutes at threshold pace with 60 second recoveries followed by another 12 minutes at race pace. 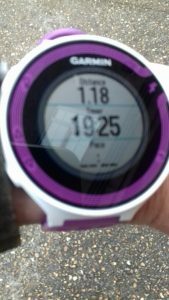 A tough session but great to get your head around the pacing and the second 12 minutes is also fat burning time as you have used up your store of readily accessible energy on the intervals so the body starts working on the fats instead. It’s a win, win. 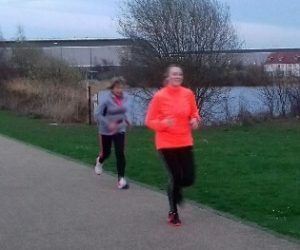 We would love to see more of you at our club sessions, they move around but are generally within a set area so that no one gets left behind and everyone works at their own pace and ability. If you are not yet a club member but would like to have a try, we are happy to offer a couple of free trial sessions before you decide, membership packages start from as little as £15 for non affiliated. Keep an eye on Facebook for where we are at each week. 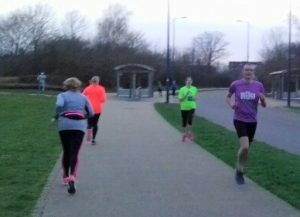 Here’s some slightly blurred pics of our session, you can see everyone is smiling cos they are having soooooooo much fun. 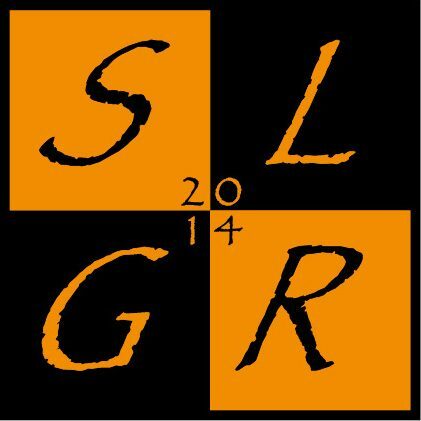 Welcome to the brand new SLGR blog where we hope to share news, achievements and information with you and more importantly about you. If you are doing something amazing, we want to know and shout about it, so please let us know and send photos. Firstly, you should have received an email today from England Athletics inviting you to renew your membership. I have just done mine and it’s a really quick and easy way to renew but if you prefer cold hard cash, Clive Penny is your man. 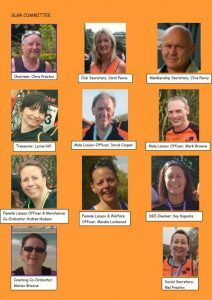 I have added the photos of the SLGR committee, any questions about membership or anything else, just grab one of us. 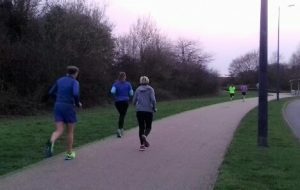 It’s only three weeks to the London Marathon so there were a few of you out this weekend for your last really long run before race day, now time to start the tapering before race day. 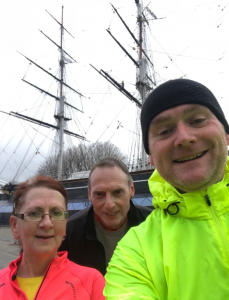 I joined Jonathon and Mark running the first 18 miles of the route on Friday, I left them at the Cutty Sark while they continued on up to Tower Bridge and Canary Wharf before coming back through the Greenwich foot tunnel. Hopefully most of you managed to come along to our flying coach visit by Mara Yamauchi last week, lots of top tips and interesting stories about marathon running, nutrition and race preparation. That’s all for now, don’t forget to check back for regular updates and send us your news. 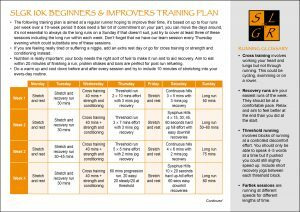 New SLGR Training Plans have now been added to the website. If you go to ‘My SLGR Results‘ on the website when viewed on a desktop computer/tablet you will have access to some training plans. These are based on your latest 10k times to guide you to the appropriate plan to help you improve your 10k and achieve or improve your half and full marathon goals.